YELLOW SPRING, W.Va., April 28, 2013 — Hali Shockey generally makes up her own mind. 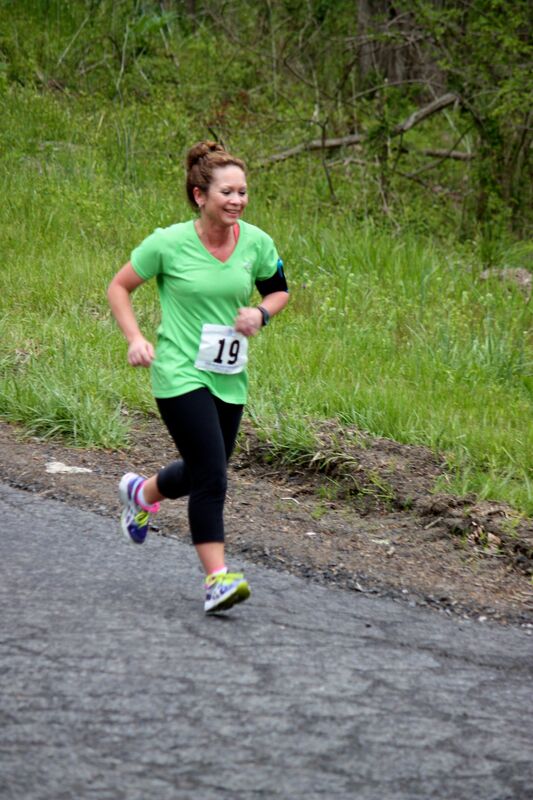 On Sunday, however, the 48-year-old Slanesville runner was glad she entered — albeit with a little cajoling from a friend — the second edition of the Red Bud 10-mile road race in eastern Hampshire County. Shockey, a trainer at Hampshire Wellness Center in Romney, earned the title of Road Runners Club of America West Virginia 10-Mile State Women’s Champion after completing the point-to-point road race from Capon Bridge to Yellow Spring in 1 hour, 33 minutes and 49.1 seconds. Shockey finished 13th overall and held off runner-up Nancy Galvan, 54, of Romney, who crossed the finish line in 1:43:15.3. 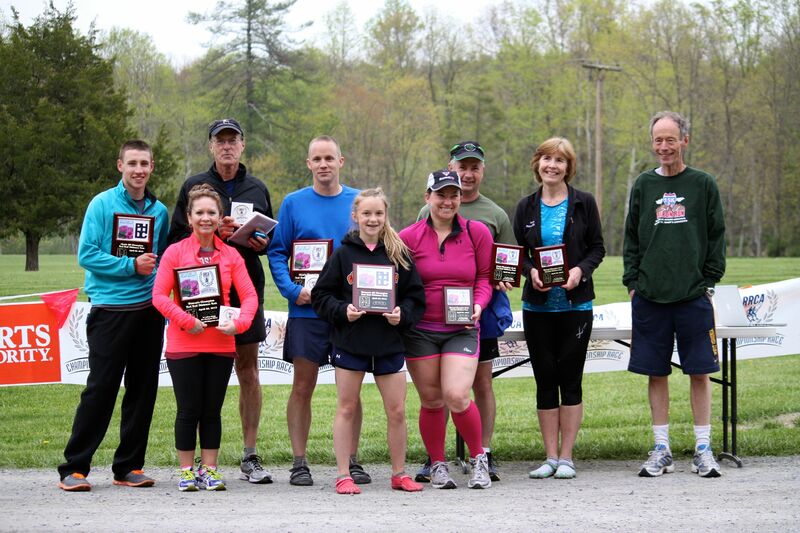 “I’m so glad (he) made me run,” Shockey said after picking up her Potomac Highlands Distance Club championship plaque and RRCA state championship coaster at the finish line, located at the Capon Valley Ruritan Club. 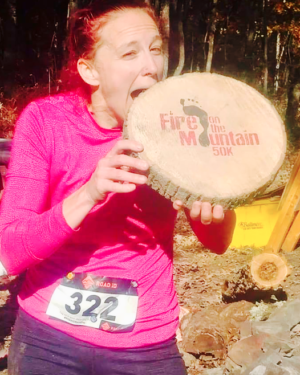 She joined the PHDC, the only active RRCA group in the Eastern Panhandle, when signing up for the race earlier that morning. For her efforts, Galvan earned the RRCA’s 40-and-over championship and the PHDC’s 50-59 age division. In the men’s race, PHDC president Kevin Spradlin, 34, of LaVale, Md., out-dueled club member Mike Meadows, two days shy of turning 56, for the overall title. Meadows, of Martinsburg, W.Va., took off from a point near the Capon Bridge Public Library at a pace better than 6:50 per mile. Spradlin and a small group of runners, including Eric Vaubel, 43, of Delray, Eric Yarbrough, 25, of Yellow Spring, and Joshua Liller, 34, of Romney, followed closely. Meadows held the lead until shortly before the two-mile mark. 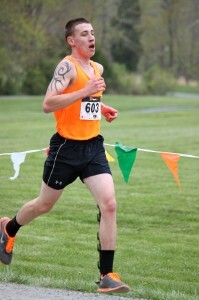 Spradlin took over until Meadows reclaimed the lead at the crest of the course’s most challenging hill at the 4.7-mile mark. Meadows later wondered if that played a role in costing him the win. Meadows and Spradlin went back-and-forth for the next two miles until Spradlin finally pulled away for good with less than three miles to go. 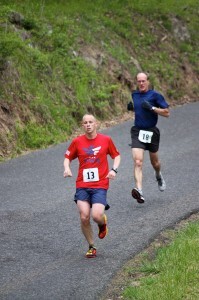 PHDC members Kevin Spradlin (13) and Mike Meadows approaching Mile 2. Spradlin stopped the clock in 1:10:34, a course record. Emily Warner, last year’s overall winner, established the previous course best of 1:13:19.7. Meadows finished in 1:11:32.6 to claim the RRCA 40-and-over state championship — his 10th state title as a masters runner but first in an open road race — and the PHDC’s 50-59 age division. Liller placed third overall in 1:13:13.1 and took home the men’s 30-39 division winner’s plaque. In the accompanying Red Bud 5K (3.1-mile) race, former Hampshire High School harrier Timothy Loughran, 20, of Romney, cruised to the overall win in 19:31.7. Neal Reimenschneider, 58, of Winchester, Va., took second in 20:41.7 to earn the men’s masters title. 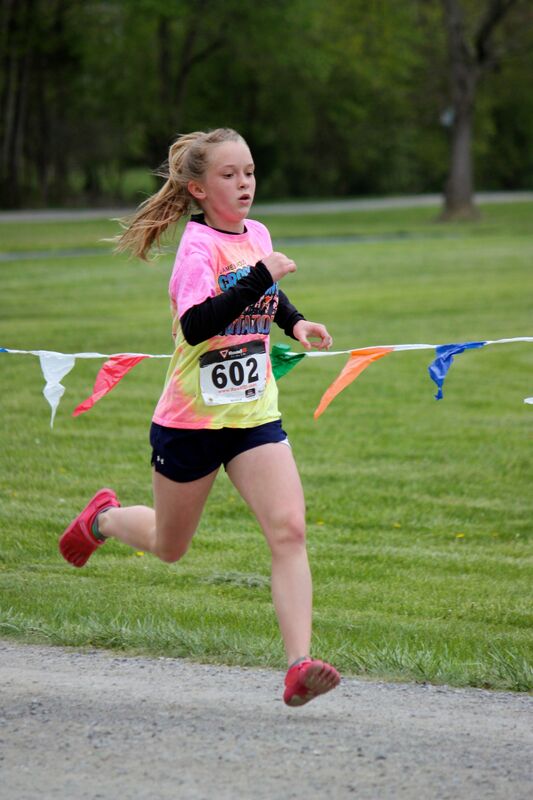 Capon Bridge Middle School cross country standout Toni Culp, 13, of High View, won the women’s title in 24:40.6. The PHDC offered a special “thank you” to event volunteers, including Noah Spradlin, Stephanie Spradlin, Lindsay Brill, Teresa Albright (with Shaina and Tracy), Catherine Dunn, Tammy Richardson and Kenny Dunn. Award winners (not all present for photo). Back row, L-R: Timothy Loughran, Mike Meadows, Kevin Spradlin, Eric Vaubel, Nancy Galvan and John Means. Front row: Hali Shockey, Toni Culp, Theresa Vaubel. Kevin, thank you for all your hard work to organize the red bud run. 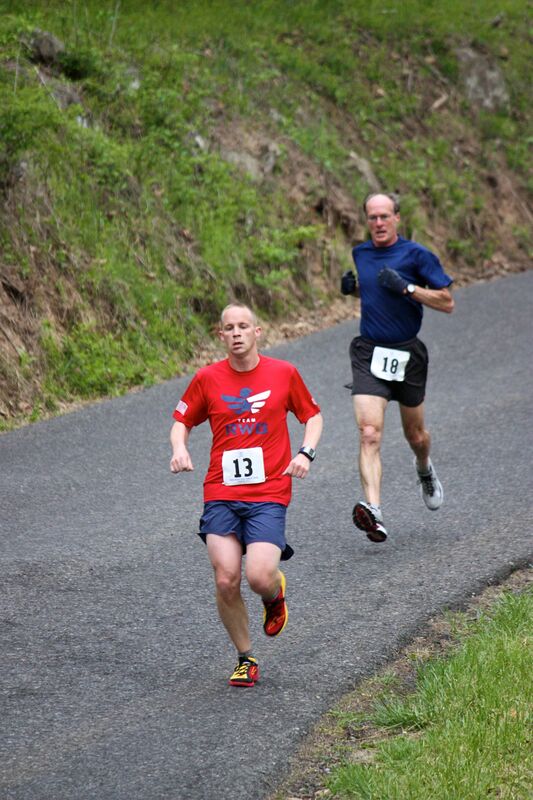 We enjoy running the course,even the hills…. Kevin, since I missed qualifying for the state meet in Charleston in 1962 by one position, it now feels great to be state champ. Thanks much for giving me the opportunity to redeem myself after 50 years. We both hope that you can keep this great annual event going, and we will talk it up around here next year as much as we can.